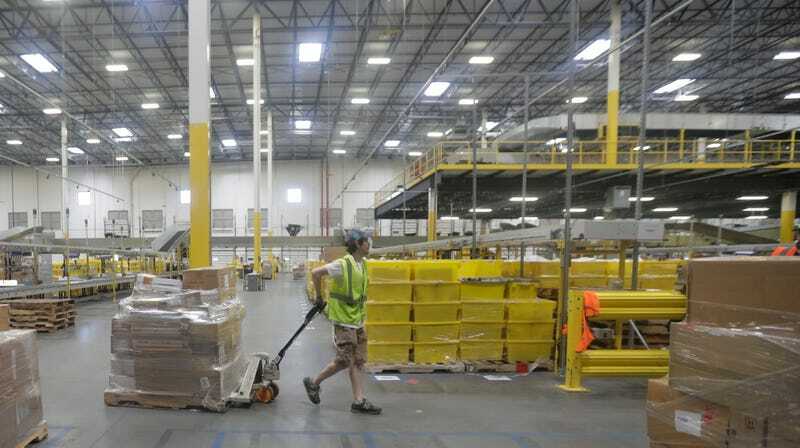 An employee pulls a cart with packages at the Amazon Fulfillment center in Robbinsville Township, N.J., Tuesday, Aug. 1, 2017. Dozens of Amazon workers at one of the company’s fulfillment centers in New Jersey were hospitalized after an aerosol can containing bear repellent was hit. The incident occurred at the company’s Robbinsville fulfillment center and left at least one person in critical condition. Lighty said that all of the affected employees who were hospitalized were expected to be released in the next 24 hours. When asked by Gizmodo about the employee reported to be in critical condition, Lighty said the “employee’s condition has improved” and that they too were expected to be discharged within the next day.